7am hookipa is head to head and a half with light easterly trades. 5 in the local scale. A SUP foiling and a shortboard session for me yesterday. Not sure I can call the last one a session though, since it was at Hookipa and the shock of surfing (or trying to) those horribly wind-blown waves after having surfed perfect waves (both on my trip and on the south shore), only made me last the time to catch one wave. Yep, I got spoiled. 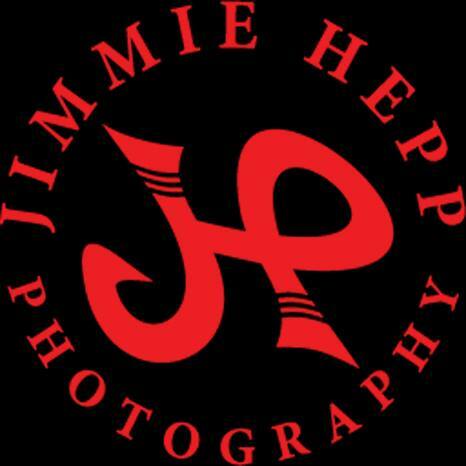 The windsurfers had a better time than me, here's a couple of photos from this gallery by Jimmie Hepp showing the size of the waves which were mostly in the head to head and a half range, with occasional doubles. Numbers still up at the buoys, yesterday the waves at thousand peaks got up to the shoulder high range before I left. 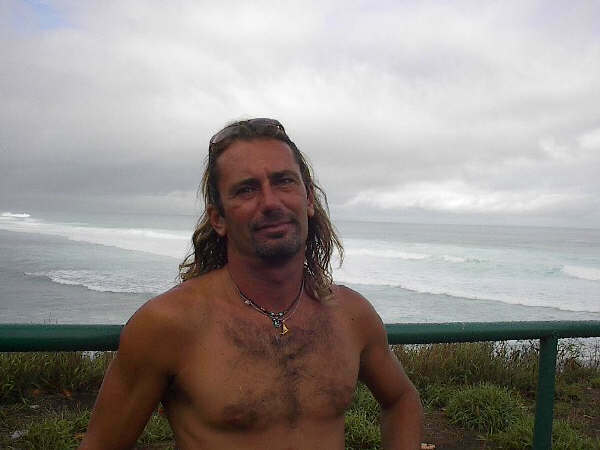 But still inconsistent, such is the nature of Tasman Sea swells. There's some sets at Ala Moana, but most of the time it looks like this. Obviously it would be better to have a webcam in Lahaina, if you have an ocean front business/house, please check the benefit of hosting one on Ozolio. NNW swell peaked yesterday and now it's from a more northerly direction, but there should be plenty waves also today, just a bit smaller than yesterday. Wind model not working today, here's the two models at the bottom of the windguru page. North Pacific still has that decent NW fetch described by Pat Caldwell yesterday, Surfline predicts 5.6f 14s from 314 on Wednesday. Which means that it should be bigger than the current one (due to its larger period) at Hookipa, a lot smaller (possibly flat) at Honolua due to its more westerly direction. Talking about the latter, I did see a picture of it, but it was from the day before yesterday and it showed very brown murky water. South Pacific has a small/weak SSE fetch. Better than nothing though. 6.30am ukumehame is mostly flat with inconsistent waist high sets and light side shore wind. I heard water is brown in the launiupoko area. 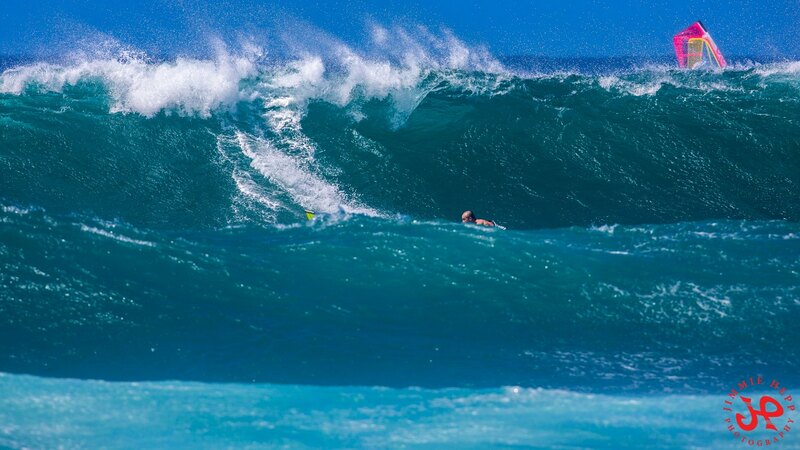 Hookipa looked like head high and not particularly clean in the dark and from the distance, but it was hard to judge. A windfoiling session for me yesterday. Here's a short clip, can't hear much at one point, I believe it's because of the new mouth mount I bought. Gonna buy another one like the old one I had and lost. The wind model was wrong and there was more wind that it indicated. 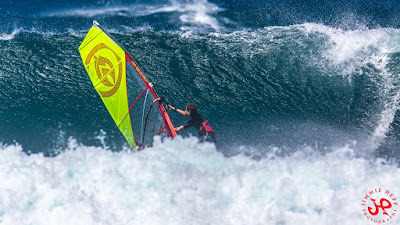 As a result, windsurfing happened both at Hookipa and Kanaha. Jimmie Hepp has a large gallery of windsurfing shots, but my two favorites are those of Savanna Stone surfing. The good long period numbers at all the buoys should not be a surprise, if you remember the fetches of a week ago. If you don't, below is the collage of the maps of Sept 22, 23, 24 and 24 that show the strong fetch that generated today's swell. Withouth New Zealand in the way, this one would be a pretty big one. Better than nothing, though. Expect low consistency, but nice over waist high sets. NNW swell is here with solid numbers, don't expect any particularly clean surf though (closely generated and with some wind predicted to be on it). Below is Pauwela's graph. The colored lines are the energy associated with the different periods, the black line is the aggregation of all of them, as explained in this article. 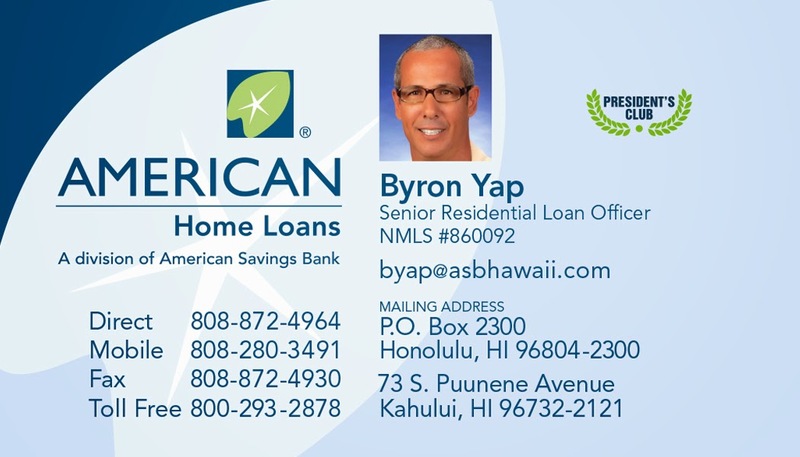 The direction is good for Honolua, if any of you guys go and take a picture, please send it to me (email address to the top of the right column). A storm-force system formed east of Hokkaido, Japan 9/27-28. It is predicted to track east into 9/29 bringing the head of a captured fetch to near 1700 nm away over the 300-310 degree band by mid Saturday. Long period forefunners are due locally in the wee hours Tuesday morning 10/2 centered from 305 degrees, building above the October average Tuesday. Models show the low pressure near the Date Line 9/29 abruptly changing track to the NE and racing to the eastern Aleutians by late 9/30. This should add energy from 310-345 degrees locally 10/3 while the 300-310 degree energy slowly decreases, keeping breakers near the October average. South Pacific doesn't have anything good instead. Morning sky is a bit deceiving, as it doesn't show many clouds, but it's raining on the north shore. 5.15am rain radar shows just that. No water action for me yesterday other than a lovely swim in the lake that the north shore was turned into. Pretty heavy rain on the Lahaina side instead caused some flooding and bad traffic. This frame from a video of Matty Schweitzer shows the light in front of Launiupoko. Small but long period readings at the buoys will make for small and very inconsistent waves on the south shore. The wind should be much cleaner than yesterday though. Below is a set at Ala Moana, which is otherwise flat for most of the time. The second webcam is Hookipa which is still looking like a lake but with occasional small breaking waves, which is a sign of the imminent change. 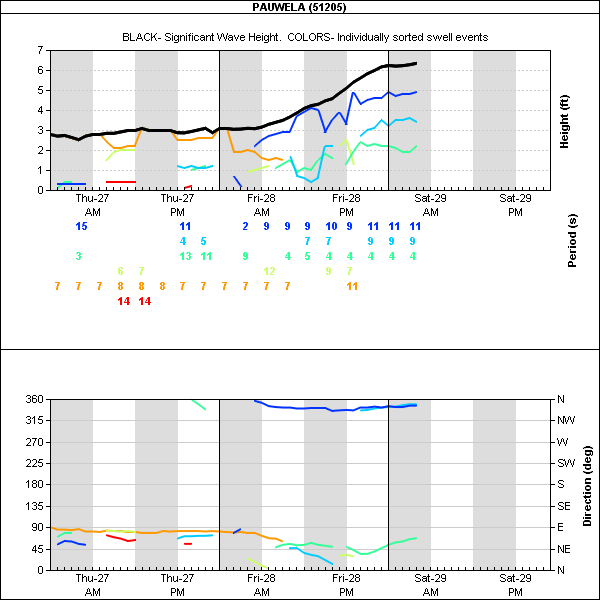 Big difference in the numbers at the NW buoys compared to Pauwela and N. That is because, I'm sure you guys will remember, the fetch originated aiming its winds to the west of us. Later in the day, the size should increase also in Maui. Here's the Surfline forecast for the next three days. They correctly only have 2.6f 9s at 9am, but coming up pretty quickly during the day and peaking tomorrow at 6f 10s from 333. Wind map at noon. Sorry, not enough wind just yet for the frustrated wind sport enthusiasts. Got to wait until tomorrow. Unfortunately, the light NE wind will also ruin the waves for the surfers. North Pacific looking good with multiple fetches. South Pacific looking grim with no fetches at all. 6.30am lahaina side is flat to knee high with onshore texture. Not worth it even for foiling. A longboard and a SUP foiling session for me yesterday, being in the water was the only escape from the heat. 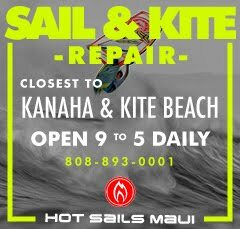 Unlike Oahu, Maui didn't have the southerly wind flow and the conditions were actually pretty sweet all day on the south shore. That's why it would be nice to have a webcam in Lahaina, please spread the word to find an ocean front business owner that would be interested in hosting one with Ozolio (more info on the website). With Bernd Roediger in front of the lens, it's very likely to get some good shots. Add Jace Panebianco behind it, and it's pretty much guaranteed. Other than the Lanai's one, the buoys readings seem to suggest another small but not flat day on the south shore. I will try to report early. Promising short period energy at the NW buoy, but that should only arrive tomorrow. For today, with less than 3f, 7s from the E, Hookipa will be like a lake again. I looked at it yesterday and it looked like the sea in Naples where I grew up. So lucky to now live in a place where a flat day is a rarity! The wind model is not showing its maps today, so we go by the classic Windguru table. No doubt that today will be another windless day. North Pacific shows the large fetch NNW of us now aiming at us even though with lighter winds than yesterday. The waves should be rising all day tomorrow and Surfline sees the swell peaking Saturday at 6f 10s from 333. To the very east and to the very west of the map, a couple of intense storms have small fetches oriented towards, but those are going to do little. 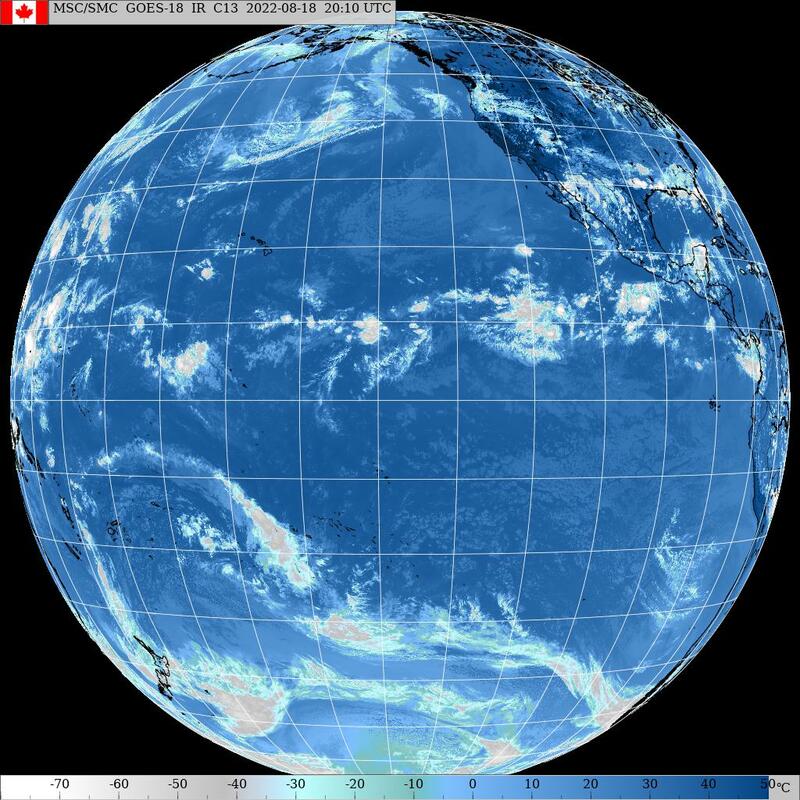 South Pacific shows the fetch E of New Zealand now aiming to Central America. Hopefully we're still in the angular spreading window. Morning sky shows some clouds over the west side. And the rain radar at 5.25am shows some rain there. A longboard session for me yesterday. This is Christian showing a nice low and centered stance while foiling on the waist high waves at Thousand Peaks. A little mid morning onshore ruined it a bit for the surfers, didn't change a thing for the foilers. Mid (12-14) period low (1.3-1.9) energy at the buoys should guarantee another non completely flat day on the south shore. The problem will be that the usual onshore wind might start earlier than usual, seen the overall southerly flow. The Ala Moana cam in Oahy shows just that and if that is happening in Maui too, today might be a day of rest. My iWindsurf.com app shows no wind yet, but it would be nice to have a visual confirmation of that. 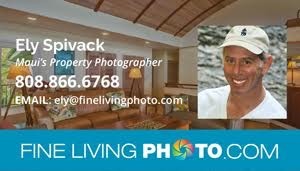 Once again, if there's a business in Lahaina that would like to host a webcam with Ozolio, please send me an email. Small windswell numbers and from a too easterly direction at Pauwela, today Hookipa will be flat. And with the lack of wind, absolutely epic for snorkeling. North Pacific's map is very similar to the predicted one I posted 4 days ago. The fetch did form N of us and at the moment is aiming to our west. It should turn more towards us during the day though and generate a NNW swell that Surfline predicts to peak at 5.8s 11s from 335 on Saturday. I'm gonna call for a very early opening day at the Bay. The Typhoon south of Japan is intensifying and the fetch oriented towards us today is slightly bigger and it should improve in the next few days. As a matter of fact, Surfline calls for a west swell Wednesday/Thursday next week. West swells are never to be excited about in Maui, unless you know where to go. South Pacific has a strong fetch E of New Zealand aimed to our east, but we'll get some angular spreading in a week. 7.15am lahaina side is knee to waist high waves with occasional bigger sets and clean everywhere. Hookipa looked chest high and poor shape from the distance. - Maui is gorgeous. My trip was so glorious that I was having a bit of a blues the first couple of days upon returning, but yesterday I was able to tune into Maui's magic again. Here's Dave Kalama gliding on the glassy waves of the early morning. This photo shows why SUP foiling boards have beveled rails. A more square rail would be touching the water in this cut back. 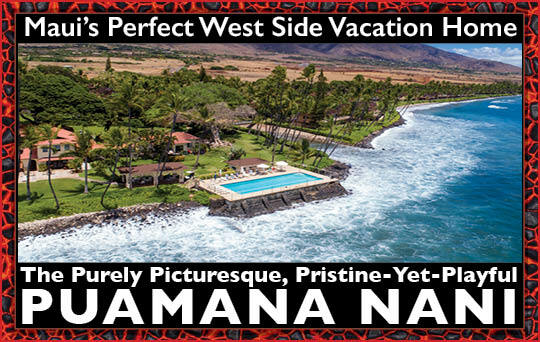 We have plenty Kalama boards at Hi-Tech. I usually prune some of the readings at the buoys if I don't consider them significant, but in this case I left them all, as they will all be in the water. That was the case yesterday on the south shore, but, as reported, there were up to occasionally chest high waves. The 14-15s component is still 1.3-1.4 feet locally (the best waves were from that) and that 1.1f 18s at the W buoy looks promising. Nothing to be excited about, but I don't think it will be flat. I will report as soon as I get there. In the meantime this early morning set at Ala Moana looks promising. It would be nice if there was a local Maui webcam, so here's the message again: I've been contacted by an Ozolio representative seeking for help in finding a business that would be interested in hosting a webcam in Lahaina. 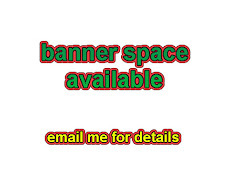 Here's one of things he outlined:"A unique thing about our services is that we can add advertisements to display before the stream as well as imbed ad's and overlay images into the stream itself. Along with social media functions like click button Facebook & Youtube live publishing. This would be an incentive for anyone that would consider installing a camera." Please help me spread the word, if you know someone interested. 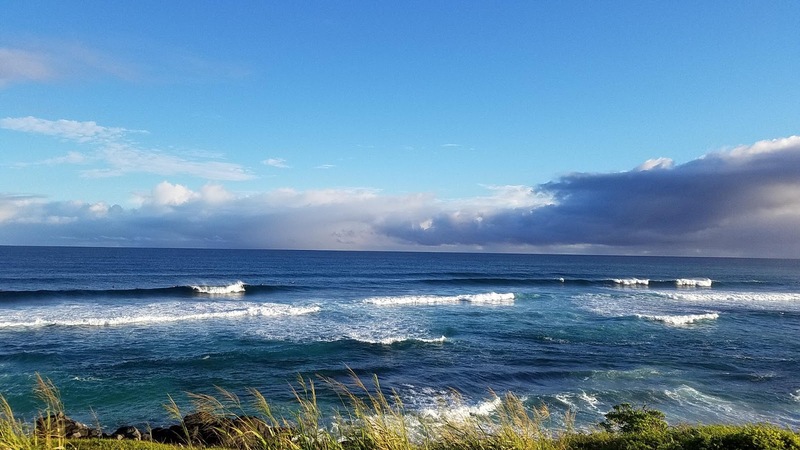 Hookipa looked tiny at sunset yesterday. This morning, thanks to the lack of wind, I hear a little more noise of breaking waves through my window, so I believe it won't be flat over there either. Wind map at noon. 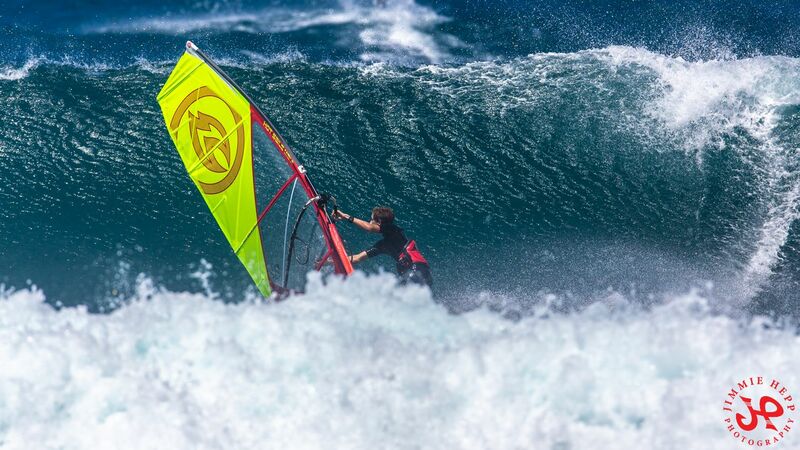 The model was correct also yesterday, as some light wind windsurfing did happen at Hookipa. No chances today. North Pacific pretty much does not have any wave generation for us today (other than that tiny W fetch from the typhoon south of Japan). The good news is that the predicted low is forming N of us and hopefully tomorrow that blue fetch will be stronger and oriented towards us. We shall see. South Pacific has a fetch so big that it engulfs all the New Zealand. Unfortunately, that means that those islands will also block most of the energy, but we're still gonna get some scraps in a week. Morning sky. Pretty heavy rain between Oahu and Kauai. 7.15am lahaina side is thigh to belly high with occasional bigger sets and clean everywhere. Hookipa looked small and poor shape from the distance. A SUP and a windfoiling session for me yesterday. Young South African Nathan Van Vuuren spent two months in Maui and impressed everybody in the foiling community with his skill and style. He's the foiler that I know that foils in the pocket the most, as he's almost doing the same lines as if he were surfing, but without the friction of touching the water with his board. This week's outlook: the waves are going to be very small everywhere before both north and south shore come back to life next week. 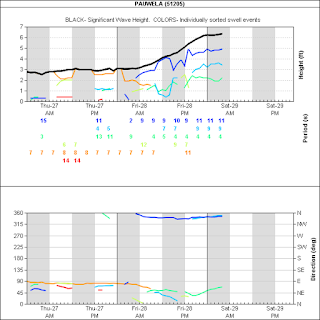 Mixed low readings of different periods at the buoys. Yesterday morning Thousand Peaks was flat to knee with occasional waist high sets and quite clean and enjoyable. Hopefully will be similar today, even though the southerly flow of the wind (see discussion below) might affect the conditions at some point. The long period low energy disappeared at Pauwela, 3.6f 9s is not much to get excited about, but at least 58 degrees is an unblocked direction. Expect very small waves at Hookipa. Wind map at noon. Yesterday many people were surprised by the fact that the north shore got windy in the afternoon. The model I use (link n. -2) predicted it perfectly instead and it shows some wind up at Hookipa also for today, in the midst of a pretty steady southerly flow happening west of the islands. But that's because by then the heating of the Haleakala will generate the usual thermal wind. Look how different the situation looks at 8am. Goona be a hot morning. Gonna be a hot week actually, as the Windguru table below shows, as the wind is going to be very light, before the trades come back (pretty strong) over the next weekend. In the map below, I drew a couple of arrows to indicate the start of the formation of an area of low pressure to the north of the islands that is responsible for the southerly flow that will kill the trades. Hopefully, in a couple of days the low should be strong enough to send us a decent northerly swell of medium period. The two circles well to the west and to the east I also drew, indicate a couple of very weak/small fetches that won't generate much wave energy for us. This week is going to have very small waves on the north shore. Pretty strong fetch in the Tasman Sea and south of it. I circled it all, but the strongest part won't have a direct aim towards us. We'll still get some angular spreading though and we'll have a decent SSW swell for all next week. Seems like very small waves also on the south shore in the meantime.